The Ideal Bird Feeder Setup - Blog - Bird Feeders Etc. It might start with a pole in the ground or maybe a suction cup to your kitchen window. However your “bird nerding” begins, we want to help you create the ideal bird feeder setup. 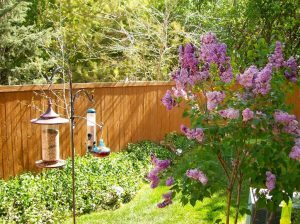 No matter how big or small, rural or urban, you can attract birds to your space using a few key parts. Geared towards attracting a continual flock of your favorite birds, your feeder setup should consist of a pole/hanger, a feeder, the feed and accessories. A grounded setup requires a pole, sometimes with a coil or arm extension, while many feeders are hung from trees & anchor points or suctioned to windows around family rooms and kitchens. Seed trays, insect moats, hooks and other accessories act as the final piece to your bird feeding puzzle. Depending on your geographical location, your feeders might require additional weather guards and accessories to keep our bird friends happy, and the feed dry. To maximize your enjoyment, and attract a diverse range of species, try placing feeders at different levels around your yard, offering different types of feed at each. There are lots of ways to increase or decrease the height of your feeders. You can find parts like pole extensions, attachments and hangers for your bird feeders giving you total control over your setup. When first creating your bird feeder setup, you may not have a ton of bird traffic. Don’t fret. It takes time for the local backyard birds to recognize there’s a new, reliable food source nearby. 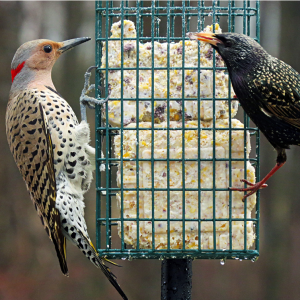 Sprinkle seeds on the ground around a feeder to encourage tentative guests or ground feeders. Be patient and give the birds time to become comfortable – you’ll be happy you did! Choosing the right kind of bird feeder is important in that birds are more likely to be attracted to certain types of feeders. The most common bird feeders are platform, hopper, hummingbird, nyjer, suet, tube, and squirrel-proof. Platform feeders attract larger birds and ground feeders like mourning doves and pigeons. Hummingbird feeders are, you guessed it, for hummingbirds. They’re red and filled with a sweet, sugary mixture called nectar. Suet feeders like this Cedar Suet Feeder are great for fall and winter bird feeding. Typically, backyard birds enjoy their helping of suet in small cages made of wire for easy access. Suet is a high-energy delicacy made from animal fat and other ingredients. The birds and squirrels aren’t great friends. Think about it: would you befriend a rodent that’s constantly trying to steal your food? Yeah, me either. Designed to feed your backyard birds and not the squirrels, some of the best-selling feeders are squirrel proof. To combat the long-tailed furry rodents from sneaking off with your seed, squirrel proof feeders feature mechanisms aimed at preventing the squirrels access to the bird’s food. After all, it’s not for the squirrels! Many of these mechanisms are weight-activated meaning the light, feathery birds do not trigger the mechanism while the heavier squirrels do. Squirrels will attempt to perch or feed to no avail. Determining which bird feed you want to put out for your feathered friends can be challenging. There are so many options on the market and just as many species to choose which you’d like to try and attract. We recommend starting with a variety of different seeds or blends – this way you’ll have the best chance at attracting a slew of species. To bring in a diverse group of visitors, most birds will snack on sunflower or safflower seeds, offer nyjer for finches, peanuts for blue jays and nectar for the hummingbirds. While not necessarily part of the feeder setup, there’s another key item that will keep the birds coming back: water. 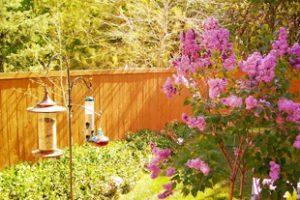 A water source is key to keeping the backyard birds comfortable in your yard. We all appreciate a swig of nice cold water on a warm day, let’s be honest. Fresh water to drink and to bathe in is something every robin, chickadee, titmouse and mourning dove can be grateful for. A few important things to consider after you’ve assembled your setup are the visibility and safety of the feeder. The feeder(s) needs to be in clear sight of the birds with easy access. Contrary to what one may assume, feeders are safer for your backyard birds when they are placed closer to windows. Birds taking off from a feeder close to a window will not be at top speed and therefore have a better chance of survival if they accidentally hit a window. Try to place your feeders within 3 feet of windows or more than 30 feet away. Check out Cornell Lab of Ornithology’s Birding Basics for more information on keeping birds safe around windows. Predators should also be considered when evaluating the safety and placement of your feeders. Trees and shrubs can provide cover and act as resting spots for looming hawks or lurking cats. The same goes for longer branches, deck railings, etc. A general rule of thumb for distance between potential launching spot in your yard is 10 feet or so, but experiment and see what works for you. As we mentioned earlier, it takes time for the local bird population to recognize your feeders and become comfortable. If you’re not seeing the birds you had hoped for, try using a different feed or blend and sprinkle seeds around the feeders. This may not be necessary once the feeders become established but it can help attract those cute little timid, tentative birds. Assemble your base: pole, hanger or window mount. Check. Next, you’ll need some feed: try sunflower seed, peanuts, suet or nectar. Dress your feeders with the most practical and coolest looking accessories because why not? With the proper setup in place, you’ll just need some patience and a few hours to relax  Good luck and happy birding!